After a long winter, you may begin to see your bathroom in a new light when the seasons begin to change. If you can live with your current bathroom vanity, shower stall and other major features in their current places, Better Homes and Gardens has a few suggestions to give your bathroom a face lift without breaking the bank. With your linen cabinets or the drawers on your vanity looking a bit ho-hum, consider replacing the hardware with some new and attractive pieces. There are a nearly limitless amount of choices to keep in mind, so try to find a pairing with your mosaic tile or another permanent feature to create a streamlined look. Your windows are another important consideration, so if you'd like a casual look that can work with a rustic or cottage aesthetic, try a pair of white shutters. Vinyl shutters are the better choices, as they can stand up to the humidity of your bathroom without warping and needing to be replaced. Spring is the best time of year to take a close look at your bathroom and find areas where it can be improved. 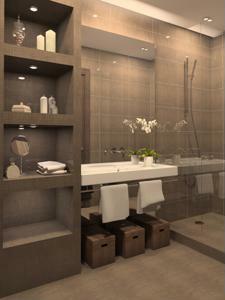 What cost-effective upgrades do you suggest for homeowners trying to upgrade their washrooms?